One of the delights of being a Stranger in a Strange Land is discovering new and wonderful foodstuffs. In one’s own country, one is fairly familiar with the products on the supermarket shelves, but being abroad opens up whole new vistas of comestible possibilities. As I stood dazzled in the breakfast cereal aisle of the local Ralph’s, I wondered how I could ever pick just one from among the thousands of brightly coloured packages. I thought I was reasonably circumspect in choosing Yogi Cherry and Almond Crunch. Sounds alright, doesn’t it? All natural, no artificial thingummybobs, none of the dreaded high fructose corn syrup (that American food manufacturers seem to throw into everything with wanton abandon) and 5 grams of protein and 3 grams of fiber in every serving (although 3g of fiber – or ‘fibre’ as it is properly spelled – does seem a little on the shy side for something ostensibly made of grains). Lotsa grains, evaporated cane juice, brown rice, almonds, but no suga….. waidjustafuckinggoddamnminute! Evaporated cane juice? EVAPORATED CANE JUICE!!!??? 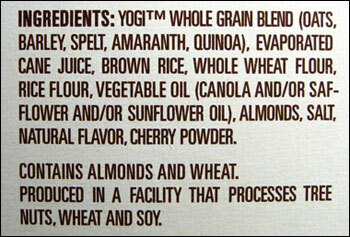 Yes folks, Yogi knows full well that the ‘s’ word is big minus mark when it comes to selling a ‘healthy’ product and so it doesn’t actually appear anywhere on the packaging. Instead we have evaporated cane juice. I almost find myself admiring their guile. Indeed, when I actually pay attention to the um… ‘creative’ language on the packet, it appears that various sugars make up almost a fifth of the volume of what’s inside the box of Yogi Cherry and Almond Crunch! A little cereal with your sugar, anyone? I’m also slightly uneasy about the cherry quotient, which is listed as cherry ‘powder’. Something about being able to turn cherries into a powder reminds me of anthrax. No, I don’t know either. Disclaimer: Readers of this post should not infer that just because I chose to buy a cereal with the word ‘yogi’ in the name in any way implies that I am some kind of dippy trippy hippy. I was merely attempting to pick a cereal that had some modicum of healthiness. Plus, I always had a fondness for pic-a-nic baskets. Hahahaha! 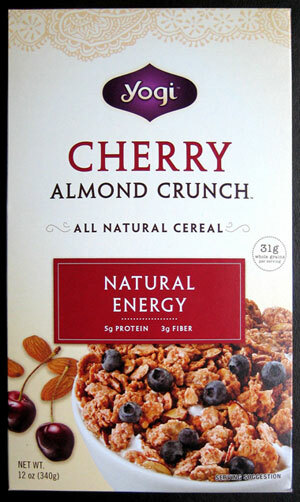 But seriously, Joseph G, you are in no danger of overdosing on grains when eating Yogi Cherry & Almond Crunch. And thanks for the more technical explanation of the ‘cane juice’ but I’m afraid that I am no further convinced by the claims on that site that there are any substantial health benefits. Sugar is sugar. A couple of extra vitamins are not anybody’s concern when adding sugar. And in any case, it’s still weasel speak. Evaporating cane juice does in fact give you sugar crystals – that’s how sugar is made! Its raw sugar at that stage – just not refined white sugar. So technically, ECJ is still SUGAR. They just don’t want to say the word! Nutrients! Looks like I’ll have to post you some car(t)men’s muesli along with that tube of vegemite. I am now on a mission. I refuse to believe I can’t get a decent breakfast cereal here in LA. In the US, everything seems sweet. Corn syrup in just about everything. And they consider sweet potato with marshmallow on, to be part of the main course, rather than dessert! But it’s the bread that got me. SO damn sweet. That’s not bread, that’s CAKE! It’s like eating at a kid’s birthday party. No wonder there are so many lard-asses in this country. I’m beginning to get disheartened that if I ever make my way down to Australia I’m not going to be able to get my kangaroo boiled in cane juice. After having to endure a jar of marmite at the behest of a Kiwi friend, the least that could be done to erase the taste from my memory would be to serve me kangaroo in a big steaming bowl of cane juice. With my luck and Dewi’s comment, you probably serve your roast koala with witchetty grubs rather than marshmallows too…. Well, technically there would be no problem with the cane juice – we have enormous sugar cane plantations up north in Queensland. So if you were really determined I could whip that up for you. Koala with marshmallows (or with anything really) presents a rather more difficult problem though, since the koala is a protected species. As far as I know, marshmallows are not yet on the near-extinction list. I appreciate the offer, but I’m not so convinced about this “protected” status. I mean, look at the caliber of people you let handle them! I don’t think letting a Catholic clergyman fondle a koala’s bottom is very much protection at all. They’re all healthy, and several aren’t very sweet. I’m partial to the Island Vanilla I just tried, and that’s listed at 9g vs 12g of sugar for the Yogi cherry. 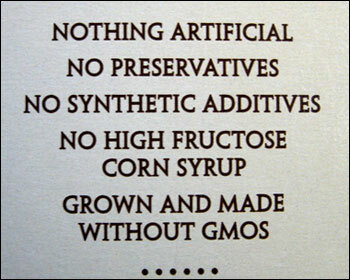 Then again,the ingredient list as evaporated cane juice AND cane syrup! Woo-hoo! The “Warm Cinnamon Oat” kashi only has 5g of sugar, but I haven’t tried it yet. Did queenwilly and The King tell you about the chocolate cereals in France? Even their evaporated cane juice is chocolate flavoured. All bran with chocolate buttons. Corn flakes with chocolate buttons. Rice crispies with chocolate buttons. muesli with chocolate buttons. We didn’t see weet bix with chocolate buttons, but I know it’s there. Those froggies like chocolate for breakfast! Jeepers. Now we’re back to the marshmallows. I see pictures of entire aisles of different milks and I wonder: Can you get plain (sans sugar) cow variety? Shopping at the supermarket is so much more difficult. You have to choose between about a million more varieties of everything. If you wanted to find out the difference between them, you’d be shopping for a week just reading labels. On a more serious note, have you tried nutella? It’s not an “American” invention, but it sure is popular here (perhaps it is in Aussie land too?). The stuff is touted as a “healthy hazelnut spread.” I just about gagged when I tried it the other day. Funny you should raise the subject of Nutella. Yes, we do have it in Australia, but I’ve never been fond of it. My current workmates, though, apply it to everything. Bagels with Nutella. Toast with Nutella. Tortillas with Nutella (I’m not kidding). One of them claims that any food can be made palatable with the addition of Nutella. I’m with you on the gagging. Tetherd Cow Ahead is powered by	WordPress 4.2.23 and delivered to you in 0.487 seconds using 102 queries.